RPS Pipe Mounting Pedestals are the ultimate solution to mounting pipe runs across a flat or pitched roof. Each RPS pipe mounting pedestal incorporates an RPS Equipment Rail to assure proper support and a superior flashing base for securing the roofing termination. On top of the equipment rail, the pipe roller assembly allows for pipe movement due to expansion and contraction while assuring that the piping stays on the support. Additionally, the pipe roller assembly allows for 12" vertical and horizontal adjustments to mount piping level and straight. 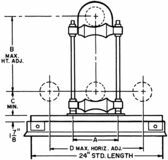 Each pipe mounting pedestal has a full line of features which allows for single to multi-pipe mounting with a minimum of effort and a maximum of speed. The sure way of attaching roof flashing. Allows proper structural support rather than on the roof surface where damage will occur. Permits a smooth, unbroken, lateral adjustment the entire length of the channel. Attached to "U" shaped mounting brackets and secured through the side of the equipment rail cap flashing into the underlying wood nailer with lag bolts. Allows for height adjustment the full height of rods. Automatically travels with vertical pipe adjustment. Allows installer to lay pipe on rollers rather than "thread the needle" at each support. 2", 4", and 6" rollers accommodate all pipe sizes up to 6" (heavy duty, larger size assemblies also available- call RPS). Longer equipment rails and slide channels, double slide channels, and multi-pipe assembly combinations available to provide multi-pipe mounting side-by-side and/or piggy-back on a single equipment rail. 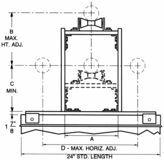 Each pipe mounting pedestal shall include an RPS equipment rail of style as shown on drawings or as specified for equipment rails 24" long for single pipe support and a single 24" long galvanized steel slide channel attached to "U" shaped mounting brackets and secured to side of equipment rail with lag bolts supplied. The 2", 4", or 6" pipe roller assembly as required shall have galvanized 18" long continuously threaded rods to allow 12" vertical adjustment, galvanized removable pipe retainer bracket, cast iron pipe roller, and lateral-adjust spacer bracket for 12" horizontal adjustment. For support of outside diameters greater than 6", use RPS Heavy Duty Pipe Mounting Pedestals.